At last! 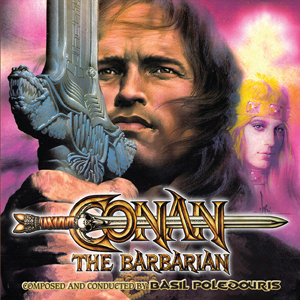 Complete soundtrack by Basil Poledouris to John Milius epic with Arnold Schwarzenegger as Conan, James Earl Jones as Thulsa Doom, Sandahl Bergman as Valeria. Legendary music needs little introduction but long journey to 3-CD set warrants spotlight. Thought missing for decades, even by composer, Universal vaults reveal recently discovered 2" 24-track & 1/2" 3-track stereo session masters in mint condition for entire project, right down to rehearsal takes! (Assorted extra tracks on earlier Varese Sarabande release were made from composer's own incomplete 1/4" two-track copy.) Having complete multi-track session elements allows Intrada to newly mix and master everything, finding cool extras in the process! All of them are here! 5/5...5/5...5/5 Is it too much Conan music/score? Hell No... I am extremely happy on this one, it's Intrada's magic skills to hear us scream for an extended original version... here it is!! So who is jealous?.. don't be get this, get this now!! Little excited about this one?